Zavetište pod Špičkom hut (2064 m), Hutte Unter dem Spitzchen, is a remote place located directly under Jalovec, and this is the best starting point for the climb of the mountain. Zavetište pod Špičkom hut as I saw it first in mid-May. A completely winter atmosphere. 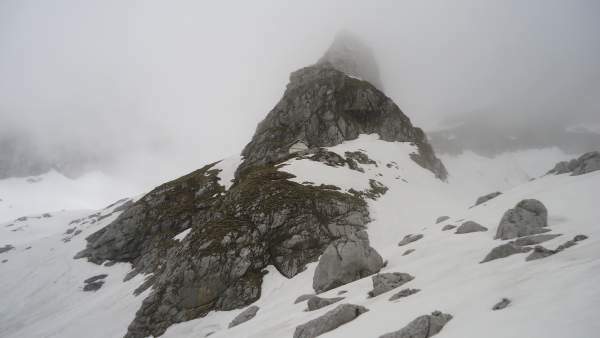 Peaks to climb around: Jalovec 2645 m, 2 hours; Bavski Grintavec 2347 m, 5 – 6 hours. 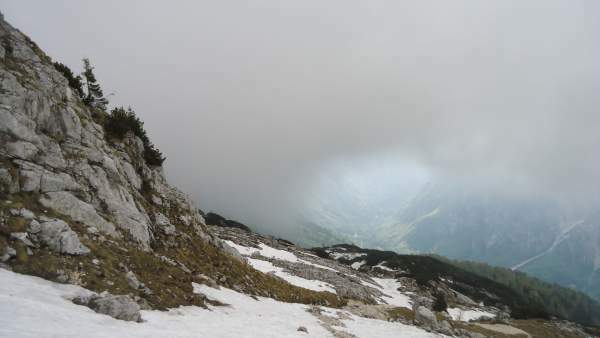 Access: Vrsic 4 h; Zadnja Trenta 3.5 h, Bavsica 5 h.
There are several routes from nearby valleys to the hut. Some are simple walks and some are moderate ferratas. One of them is described by the Guest Author Martin Olsen, so please have a look in his text about Jalovško Škrbino route which partly goes the same way as described here in the text. 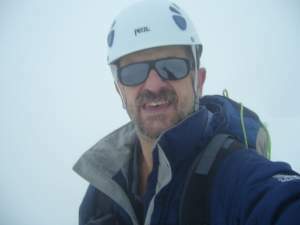 I myself also climbed Jalovec following the same route so check my text here. 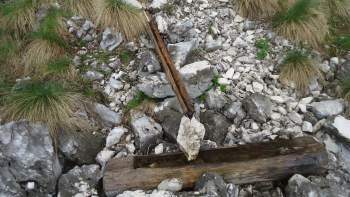 The easiest is the northeast route from the Vrsic Pass (1611 m). I walked the route in 2017, so I am able to say more about it. Formally, the altitude difference is only 453 meters but there are sections where you descend so the actual difference is bigger. You will need around 3 hours to get there from the Pass, but this can be much shorter if you push hard. Most of the time this is a pleasant walk through the forest. At some places, Soca valley was visible below. This is one of the lowest sections of the route. 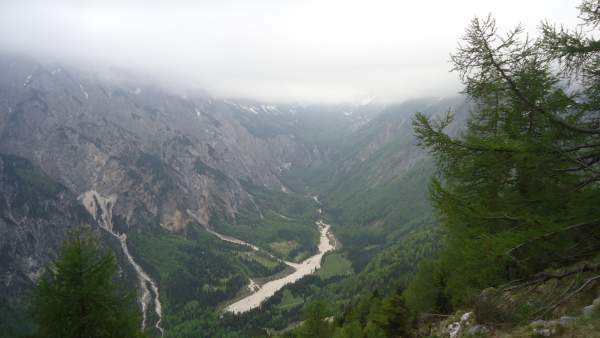 The upper part of the route, Soca valley far below. When you are above the tree line, the route changes direction and you will be going towards the northwest. It becomes much steeper and you have views around, assuming that you have a nice weather and not clouds as in my case. You can get some idea about this part from the photo above. The hut is open from June. Before that, you will not find anybody there. I passed the route in mid-May and have not met anybody. It was obvious that I was the first person passing the route after the winter. 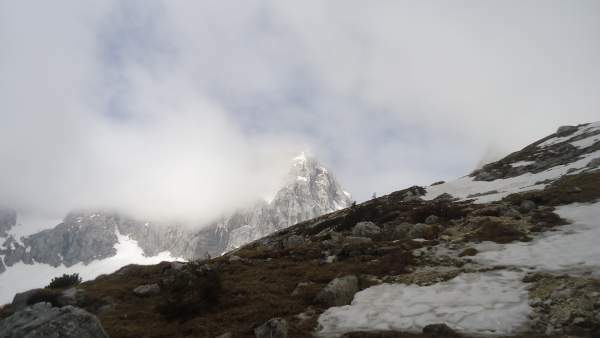 The upper part was completely under the snow, so it was difficult walking and finding the route. If Jalovec is your target, there is no much point of going so early in the season. It is under snow and climbing is dangerous. Finding the route is also difficult, so it is better not to go. But getting to the hut alone is a nice day tour and I am convinced you will enjoy it. I did for sure. 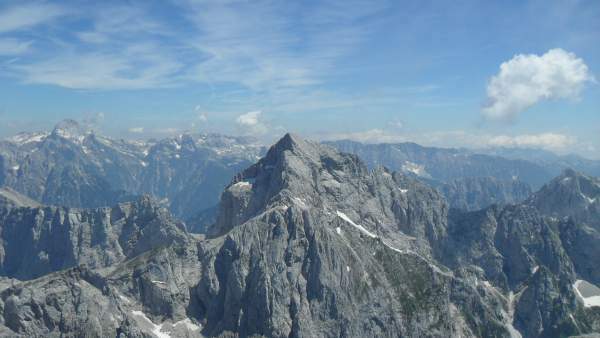 Only one moment with views – the upper part of the route. Another walking route is from the Trenta valley. So this is the southeast approach, I walked it a year later. 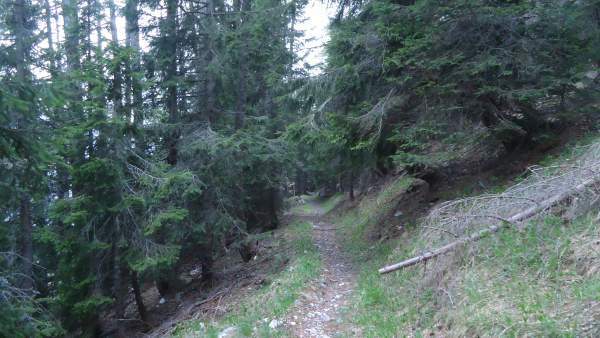 This access is shorter and far steeper, the route zigzags through the woods, and at some point, it joins the route from the Vrsic pass. So for this route, you start from the valley floor which is at some 900 meters above the sea level. This is what makes it more demanding, the altitude difference is more than 1100 meters. Yet another option is the north approach from the Tamar valley. This is again a big altitude difference because you start around 1100 meters above the sea. This is a far more demanding option than the other two routes because you have ferrata sections on the way to the hut. I did not pass it myself, but there are many videos available on YouTube. 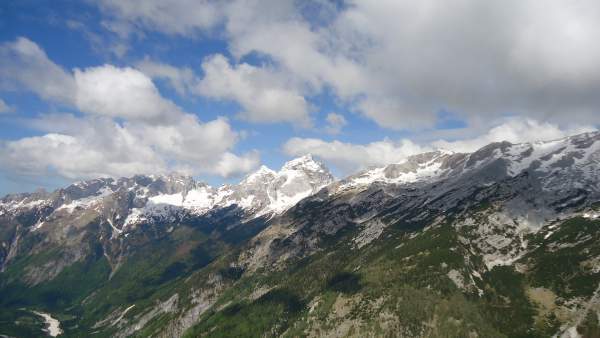 Slovenian Alps are without permanent snow and there are no glaciers. 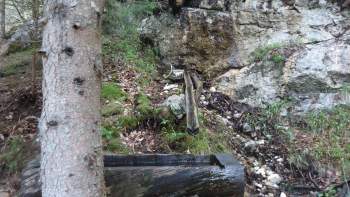 So you have far fewer water streams as compared to the higher Alps in the nearby countries. This is so in general, not only for this particular case. There were two very tiny water streams on the route. In spite of the late snow that was melting on the peaks above, the water flow was really slow and it was almost impossible to collect it. You can see them in the pictures. A tiny water source on the route. But I did collect some because I wanted to test my brand new water purifier Pure2Go. My guess is in the summer time there would be no water at all; let me know if you get there in summer. It is best not to count on these sources, so carry your water with you. As for the equipment, if only the hut is your target, you do not need anything special. Ordinary hiking shoes or boots will do the job. But if the route is under snow, make sure you have a waterproof footwear. As always in the Alps, I had waterproof pants in the pack, waterproof gloves, and a waterproof jacket as well. You can read more in my text what to wear for summer in the Alps. I also used trekking poles as usual. However, if Jalovec is in your plans, you might want to carry ferrata stuff with you and a helmet as well. Jalovec as seen from the south slopes of Prisojnik. The route to the hut goes nearly horizontally through the woods. So, visiting Zavetište pod Špičkom hut was a pleasant experience for me. I knew I would not be able to continue to Jalovec, so getting to the hut was enough for that occasion. But, sooner or later, I shall be there again, Jalovec is a too beautiful mountain to be let alone. Earlier, I have seen it from the other side, from the summit of Mangart, and I knew I would climb it once, see it in the photo. Jalovec mountain as seen from the summit of Mangart, from my climb in 2010. But there is more in my obsession with the mountain. There is a book by Serbian writer Raško Dimitrijević (1898-1988) with the title that could be translated as ‘To the heights and silence’ (in original Serbian this is ‘Ka visinama i ćutanju’). The book is about Jalovec and about mountains, an extraordinary stuff written by a professor of Serbian language and literature, the most beautiful style and language one can imagine. He was a passionate true alpinist and climbed these Slovenian mountains in the period between the two World Wars. At that time this was the part of the Kingdom of Yugoslavia. I bought the book in my student days, and I read it 5 times (so far). Thank you for reading. Let me know if you have questions and comments, there is a comment box below.